Internal bleeding is often one of the most critical consequences of trauma to the body. The blood leaked from the blood vessels or organs may be difficult to detect but they require emergency medical assistance as they can easily become life-threatening to the victim. Internal bleeding may arise from even slight major trauma. It can occur immediately or after a few hours. 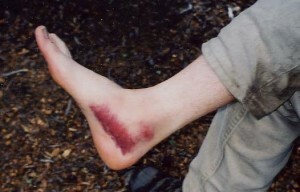 Bleeding may stop on its ownbut severe bleeding would usually require surgery. Even though any organ can be damaged and lead to internal bleeding, there are certain regions in the body that are considered most serious and require medical attention immediately. for internal bleeding. If possible, have someone call for an ambulance immediately. Give first aid while waiting for the ambulance. If possible, wear gloves in case external bleeding occurs. Check for airway, breathing and circulation. If necessary, initiate CPR. If he victim is conscious, advice the victim lie down and elevate the legs if possible. If the victim is unconscious and breathing and with no apparent head, neck or spinal injury, place the victim in recovery position. Cover the victim with a coat or blanket to avoid shock. However, if symptoms of shock are observed, treat for shock. Consistently check and monitor vital signs. Do not leave the victim alone at all times. Internal bleeding is a medical emergency and giving first aid might just help save a life. Enrolling in first aid courses can help treat and manage victims of medical emergencies, especially those with bleeding, whether internally or externally, injuries.